Review:I have read two high fantasy books this year that were on an epic level of goodness which was Stolen Songbird by Danielle L. Jensen and Heir of Fire by Sarah J. Maas and now I can say there is a third to the list Snow Like Ashes. I had to wait a few days before I could write this review to make sure I sound sane when writing it instead of completely fangirling. Right off the bat I don't have anything negative to say about the book at all...not even a little bit. The world building, the characters even the secondary characters were all done so well. After I was done reading the book I was actually in a state of "I don't know what to do with myself" for a little while because I had immersed myself so much into the world Raasch created that I was sad to leave it. The world created is pretty huge, there isn't just one or two kingdoms, no there are eight and we learn bits and pieces about all of them along with the alliances between the kingdoms and who hates who etc so yes there is a bit of info to take in when you first start reading but it was explained in a way where I wasn't bored and it didn't feel like an info dump. When it came down to it though the story was mostly focused on two of the season kingdoms ( Spring and Winter ) and one of the Rhythm Kingdoms, Cordell. Then there was the magic this world had and it was so original the history behind it and how it was used I loved it and can't wait to learn more about it, because evidently what the people thought they knew about the magic isn't all true which Meira came to find out in her battle of trying to free her fellow Winterians from the grasps of the Spring King. I loved Meira, she is a soldier, strong, courageous and passionate and badass with that chakram of hers. She doesn't remember Winter, she was a baby when Winter was overthrown by Spring but she is determined to do whatever it takes to get her people out of slavery and back to Winter. She was just incredible I loved being in her head, she had flaws and doubts also which made her seem so real. There is also Mather and Theron. Both of these guys had some seriously amazing qualities although I'm loving Theron just a little bit more. Yes there is a love triangle and if you follow my blog you know how much I hate them and how very few authors I have ever read get them right. Well Raasch is now added to the list the love triangle was done very well I was not annoyed by it all. At first Meira thinks she is in love with Mather, I mean after all they practically grew up together so naturally they developed feelings but then enters Theron the prince of Cordell and well he makes Meira feel things that she didn't even feel with Mather so honestly I can't wait to see who she ends up with because she has a very complex relationship with Mather and building one with Theron as well. There is an insanely awesome plot twist at the end that just blew me away as well. 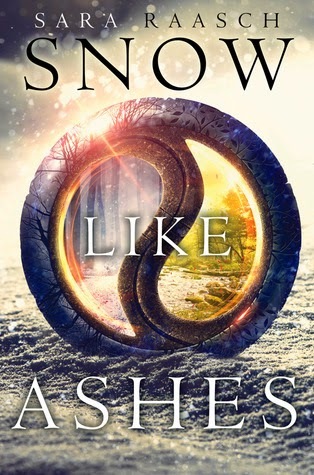 Overall Snow Like Ashes is a stunning addition to the high fantasy genre and I will be counting down the days until the next book in the series comes out. ~"You may have me trapped in this." I tug him off me. "But you aren't the first man to underestimate me, so may I advise you to start treating me with a little more respect, King Noam." ~ "That's why literature is so fascinating. It's always up for interpretation, and could be a hundred different things to a hundred different people. It's never the same thing twice." ~ "Sometimes placing our belief in something bigger than ourselves helps us get to a point where we can be enough on our own, magic or no magic."